In this image the extent of the modeled groundwater contaminant plume is within the green oval. 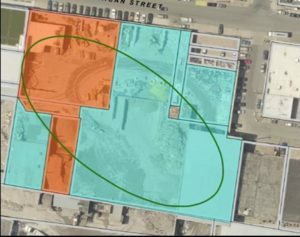 The area shaded in orange is the subject property, a former auto parts re-manufacturing facility for which Liberty provided Act 2 site cleanup services. After a failed attempt at an Act 2 attainment by another consultant, Liberty was retained to complete remedial attainment at a former automotive parts remanufacturing facility in the City of Philadelphia. The project site and its immediate surroundings had been in active industrial use since the 1920s, and had recently been incorporated into a large scrapyard complex. Groundwater below the site had been impacted by several chlorinated solvents, originating from nearby upgradient parcels. The new approach required a complete re-assessment of the remedial goals of Liberty’s client, and those of the current property owner. While the prior remedial strategy had attempted to rely on a demonstration of Pennsylvania Department of Environmental Protection (DEP) Statewide Health Standards, such a demonstration would have required expensive and time-consuming groundwater characterization tasks that were not likely to yield data meeting Act 2 attainment criteria. As an alternative, Liberty focused on the lack of exposure pathways present at the site, and proposed a supplemental characterization scope of work to confirm this lack of pathways. Through a vapor evaluation and detailed groundwater fate-and-transport modeling, Liberty was able to accurately determine that the impacts to groundwater would not pose any risk of exposure to site occupants, and that the modeled plume did not extend to any sensitive downgradient receptors. This effort was strengthened by a fortunate condition of the site’s infrastructure, which included a massive concrete slab and a lack of enclosed or occupied structures across the area of impact. Having established these conditions, Liberty submitted a revised Notice of Intent to Remediate (NIR) under Act 2, proposing to demonstrate attainment with the Site-Specific Standard using the pathway elimination method. A reduced groundwater attainment period was negotiated with DEP and resulted in the performance of just four quarterly rounds of groundwater sampling. All of Liberty’s modeling predictions and characterization conditions were confirmed through the attainment round and a combined Act 2 Remedial Investigation Report/Final Report was submitted to DEP in January 2017. DEP quickly approved the Report, together with an Environmental Covenant that established limited activity-and-use limitations (AULs) including non-residential occupancy and a restriction against potable use of groundwater. Through Liberty’s early efforts to confirm acceptance of these AULs by the property owner prior to the renewed Act 2 attainment, the Covenant was welcomed as a key component of the successful Act 2 efforts.